As Donald Trump and his administration get settled in the White House, Press Secretary Sean Spicer has announced that four "Skype seats" will be added to the briefing room later this week. This technological addition is meant to open up the press conferences to journalists outside of the Washington, D.C. area as well as organizations that don't have access or funds for a day pass. Video conferences are very common in the private sector for multinational corporations, but this is the first time it has been used for such high profile and public events at the White House. Spicer didn't elaborate on which organizations would get to use the Skype seats or how the whole system will work, but that will become clear once it's implemented. This announcement came during Spicer's first official briefing and it follows a minor controversy he created a few days before by overstating the attendance of President Trump's inauguration. An interview between counsellor to the president Kellyanne Conway and NBC anchor Chuck Todd further increased this controversy after she stated Spicer had given "alternative facts" about inauguration attendance. President Trump and his team have received negative news coverage in the past and this move looks to be an effort to shake up relations with the press. There was previous discussion about the possibility of moving the briefings to a larger room or just rearranging the seating chart in the current room. 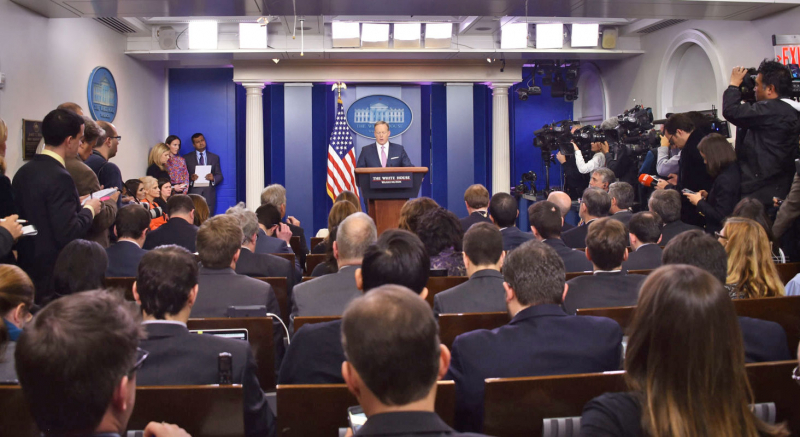 The Skype seats will offer press briefing access to a larger and more diverse group of journalists; something the administration is hoping will help make their transition go more smoothly.